Spring break got you down? If you’re basking in the glory of a week off from school, you might be a student or a teacher, but it’s likely you’re not a parent. 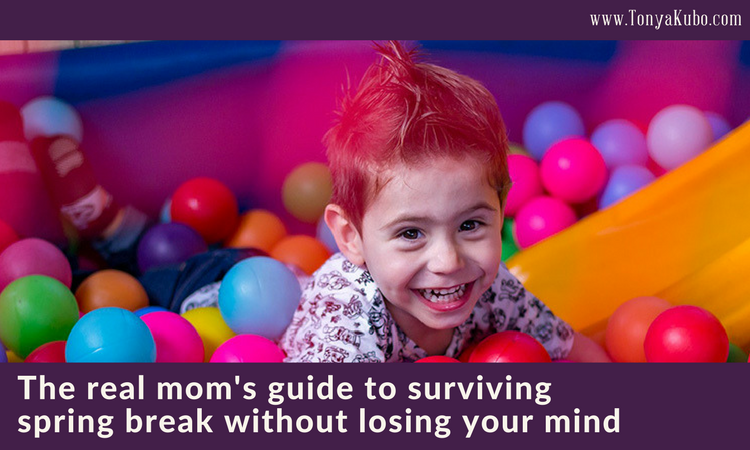 As a mom, I’ve found spring break never lives up to expectation because there’s always too much to do in too little time. In February and March, I cling to the hope of no school for a week like a buoy, keeping me from drowning in a sea of chaos. Married to a teacher, I make big plans. I give him a big list of tasks. Sometimes I take time off from work to take the kids on adventures, get caught up around the house and do all the things we can’t seem to manage when school is in session. I take time off from work to live out the fantasy listed above, but everything goes sideways in a flash. The grass isn’t greener during spring break; it’s an optical illusion. Whether you’re at home with the kids all week or shipping everyone off to different places, embrace the fact that fantasy and reality rarely align. It’s inevitable that someone will get sick (our youngest is on the couch right now with a 101-degree fever), someone will be grumpy, and someone will be wired for sound. My floors were mopped yesterday but the counters look a bit like a fraternity house the morning after a big party. Thank God for dishwashers and Netflix. This year, we all had one shared day off. My nature is to pack every minute of that single day with every possible activity: cleaning, playing, cuddling, sleeping and catching up on work or whatever. Not this year. We opted for a loose plan that involved dad taking the girls to the park while I ran some errands and checking in throughout the day. The result was no disappointment over unmet expectations and no discouragement over undone tasks. Instead of lofty expectations, why not just set one single goal for the week? If your hope is a week of rest, find a friend to host a play date one day so you can catch a nap. Even better, offer to trade. She can take your kids one day and you’ll take hers the next. If you want quality time, plan just one activity with the kids that’s equally meaningful for all. Our firstborn loves “family movie night.” Her sister loves the rare treat of eating popcorn on the couch. Combine the two and it’s 90 minutes of entertainment for everyone. If I had to sum up my secrets to surviving spring break, it’s about managing expectations. It’s too easy to get caught up in what we see and hear others doing, but we have to stick with what works for us and our families. What works for the homemaker doesn’t always work for the working mom and vice versa. Now it’s your turn. Do you have survival secrets not listed above? Share them in the comments below and help me to create a tip list that other moms can use to save their sanity in all seasons. I have nothing to add! This is great! !